Oklahoma City Thunder Official NBA 29 inch Long Premium Felt Pennant by Wincraft by WinCraft at Basket Express. MPN: 26301014. Hurry! Limited time offer. Offer valid only while supplies last. Congratulations Kevin Durant! Celebrate the 2014 NBA MVP pick with this terrific Premium Pennant. Features the official team and 2014 NBA MVP Logos. Congratulations Kevin Durant! 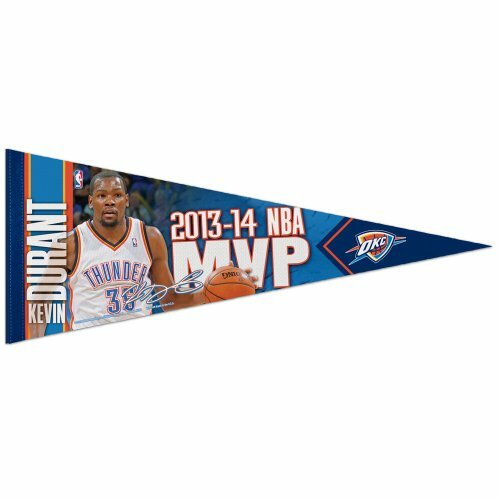 Celebrate the 2014 NBA MVP pick with this terrific Premium Pennant. Features the official team and 2014 NBA MVP Logos. Measures 29" Long. Officially licensed by the Oklahoma City Thunder and the NBA.The soft felt pennant 12x30 is a full color and is durable enough to Roll it and Go when you're at the game, and it looks great when you get home. NBA 77238091 Golden State Warriors Premium Pennant, 12" X 30"